Cogent Cross Traffic Alert provides a set of computer vision algorithms which can be applied to highly distorted (fish-eye) cameras to detect various objects which are crossing a host vehicle’s path. As with all of our software: Contact us to discuss how we can best support your project. Royalty-free licenses to our existing software may be available in certain arrangements. Cross Traffic Alert is usually considered a radar-based feature. While 24 GHz radar sensors have become affordable and can be used to support Cross Traffic and Blind Spot alerts, they still do add to the price of a vehicle, and are therefore available only as an option. In contrast, Cogent Cross Traffic alert is based on a set of computer vision algorithms which can be applied to the image from a backup camera – a camera that at least in the US is standard equipment of a vehicle to meet the FMVSS 111 safety standard. 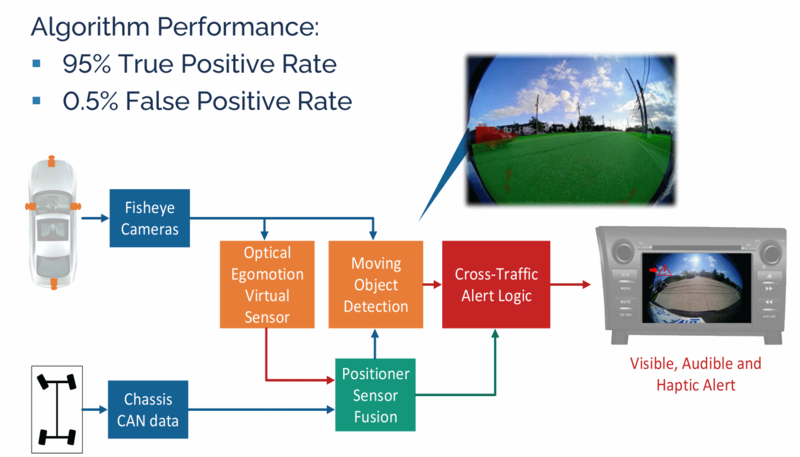 Our cross traffic alert algorithms are able to detect various moving objects, e.g. cars, trucks, buses, bicycles, pedestrians, and shopping cars. The algorithms have been developed and tested with an internally developed proprietary database of cross traffic scenarios, which includes various difficult light and weather conditions. The algorithms utilize a fisheye camera input to ultimately generate a visual, audible or haptic alert. Subject to continuous improvement, the algorithm presently achieves a 95% true position detection rate with a 0.5% false positive rate. And as all of our algorithms: Cross Traffic Alert has been designed from the ground up to run within the constraints of embedded automotive systems. Copyright © 2017 Cogent Embedded, Inc. All rights reserved.